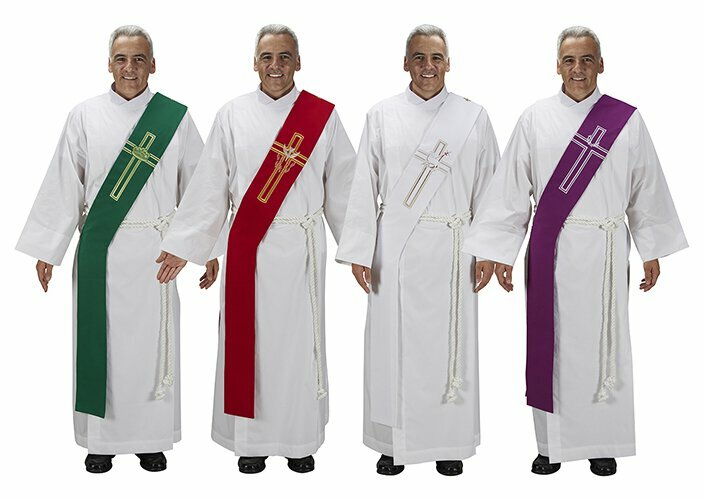 The Lucia Collection from R. J. Toomey™ is a collection of vestments and banners featuring four liturgical symbols on the most popular liturgical colors. Coordinate your vestments and worship space year-round! Stoles feature an embroidered design, fully fused with interfacing for added structure and reinforced stitching and seams. Side cord keeps stole comfortably in place. Set includes one each of Loaves and Fishes (#B2991), Pentecost/Confirmation (#B2992), Lamb of God (#B2993) and Crown of Thorns (#B2994) Deacon Stoles.